These instructions describe how to make a semicircular veil such as the one shown in the photo to the right. If made of a fabric with some body, this type of veil is suitable for one-handed veil work, double veil, and toreador-style cape work. If made of sheer fabric such as the semicircular veil shown in this photo, the veil can be used for many of the same veil techniques as rectangular veils. Photo to the right was taken by Bill Corwin. Click on it to see the veil in more detail. 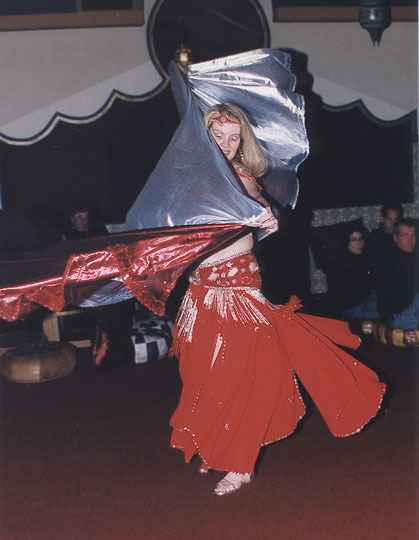 According to dance researcher Morocco, the use of 3-yard rectangular veils began in the United States in the late 1950's and 1960's when American dancers who got jobs working in the ethnic nightclubs had little knowledge of how to actually dance. One thing they did to fill their performance time was to bring a veil on stage with them and work with it for a bit. 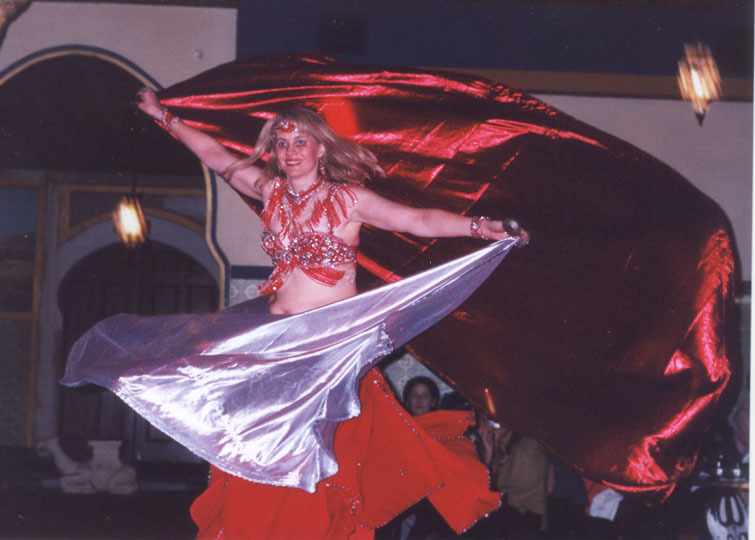 Over the subsequent decades, use of veils has evolved into an integral part of American Classic style of belly dancing, and creative dancers have developed many beautiful ways to use them. Click on the photo to the right to see a pair of semicircular veils made of tissue lamé fabric being used for double veil. Photo by John Rickman Photography, San Jose, California. 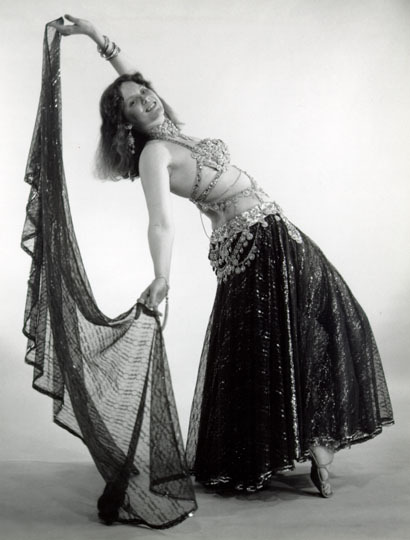 So far as I have been able to learn, the first dancer to use a semicircular veil instead of a rectangle was Jamila Salimpour, who was a popular teacher of belly dancing in the San Francisco area starting in the 1960's. She got the idea from watching films of Egyptian dancers who entered wearing capes and then removed them. The recommendations below for fabric and trims offer two versions. For a Light and Floaty Veil. The fabrics and trims under this label would be appropriate for either a beautifully-dyed silk veil, or for a sheer veil such as the one shown in the black-and-white photo at the top of this article. Semicircular veils made using these recommended fabrics and trims can be used in many of the same ways as rectangular veils. For example, the veil could be held in a beautiful pose that frames the dancer's body as she does undulations. For a Veil With Body. The fabrics and trims under this label would be approrpiate for a dancer who intends to use the veil for either one-handed veil work, toreador-style cape work, or double-veil technique, such as what I am shown doing in the photo above with the red and silver veils. Both types of veil are beautiful, and both dance styles can be mesmerizing. Before moving forward with a project to make a semicircular veil, it is important to consider the type of dance technique to be used, and then select the fabrics and trims recommended for a veil that will match. The amount of fabric to buy will depend on the finished veil size desired. If you are making a veil out of fabric narrower than the widths described above, you'll need to piece your veil. "Piecing" refers to making a seam in it. Instructions for piecing are included in this article. Some people try dealing with narrower fabric by just rounding off the corners instead of piecing. This is not recommended. Such veils do not move as well as ones that are fully half-circle sized, and they look amateurish. They give the impression the dancer was too cheap to buy enough fabric to do it right. The veil in this photo is made of silk habotai fabric. The two veils in this photo are both made of tissue lamé fabric. Chiffon. Either silk or polyester. Silk Habotai. The most popular fabric used for the beautifully dyed veils. Silkessence. 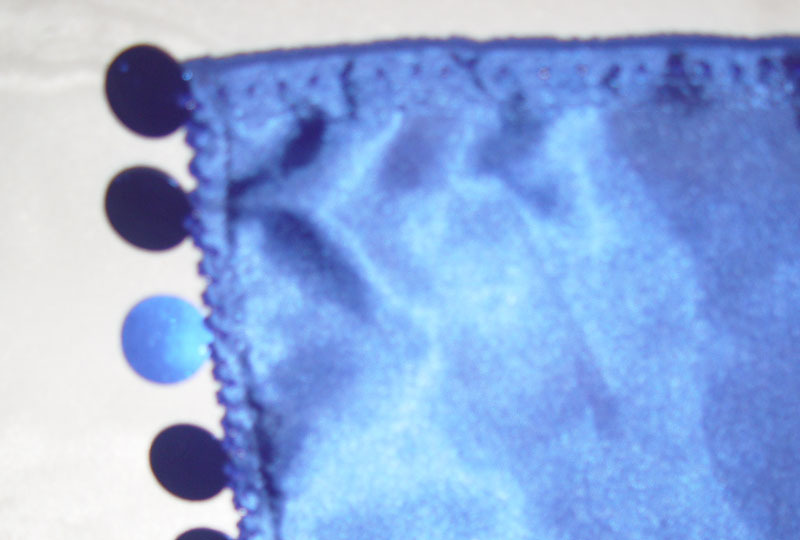 A polyester fabric with a texture that resembles silk. Nylon Tricot. Inexpensive and fine for students, not recommended for professional dancers. Tissue Lamé. The best option for people who are new to doing double veil. Doesnt drape as well as other fabrics because its so stiff, but it's shiny enough to capture the light, and moves well. Foils. For example, liquid gold & liquid silver. Shiny enough to capture the light, and move beautifully. Georgette. Not shiny, but moves beautifully. Lace. Has a tendency to get caught on jump rings, rhinestone prongs, sequins, and other costume embellishment. Before spending money on trim for your veil, it is important to decide what kind of trim you will use. When making veils with body, I usually put a different, simpler trim on the straight edge than I do on the curved edge. This allows my fingers to detect which edge of the veil they are holding, to ensure that I'm holding the edge I intend to hold. For the curved edge. 5 1/4 yards or meters for each row. Tape together newspapers to make a sheet that is 54 inches square. Tie one end of a string to a pencil. Cut the string so that it is 54 inches long. Use the pencil end to draw an arc. Cut along the drawing line. Fold the fabric so that the cut edges are together and the selvages run along both the top and bottom edges. Place one of the straight edges of the pattern against the fold, and cut it out. If the fabric is too narrow to cut out the full-sized pattern piece, then use the left over fabric to cut the missing part. Some people prefer to handle piecing by cutting pie-shaped pieces. These could be cut either as three pieces each the size of 1/6 of a circle, or as four pieces each the size of 1/8 of a circle. This is more difficult to do than the horizontal-line style shown above because of the need to sew the seams along the stretchy bias of the fabric, and therefore wouldn't be recommended for someone who is a beginner at sewing. This approach also requires more fabric than the horizontal-line style. If the fabric is to narrow to cut out the complete half-circle piece, it will be necessary to sew one or more seams. This will result in a seam near the lower edge of the curve, but dont worry  when the veil is in motion during the dance, it wont be noticeable. 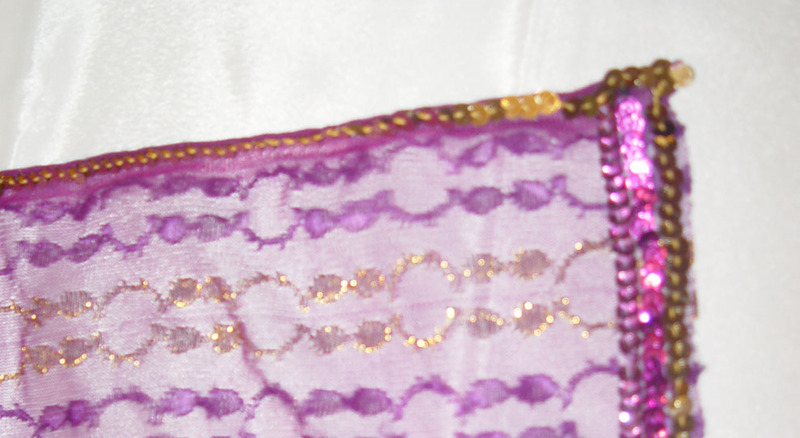 Some dancers decorate this seam with trim to disguise it, but I prefer to leave it undecorated because the trim calls attention to the horizontal line. To piece it, sew a very tiny seam, 1/4-inch (.64 centimeters) wide or even narrower. Then press the seam either up toward the top or down toward the bottom, and stitch the edge down. To hem the curved edge: First, place the raw curved edge in your sewing machine and stitch a line 1/4 inch (.64 centimeters) from the edge all the way around the curved edge. Next, sit in a comfortable chair and turn the hem under along the stitching line, and turn it under again. Pin into place about once every 12 inches (30 centimeters). Youll find that the stitching line makes it easy to get the curve to behave itself. Then, machine-stitch the hem in place. Instructions for or more detailed instructions on making this hem appear elsewhere on this web site. You probably don't need to hem the straight edge, because it lies along the selvage of the fabric, and the selvage doesn't ravel. However, I usually do turn it under and stitch it anyway, because that gives it added strength and makes it hold up better when I dance with it. It also makes it easier for my fingers to detect the edge of the fabric when dancing with it. Attach the trim to the right side of the straight edge. Attach the trim to the right side of the curved edge. Making A Rectangular Veil. Written by Shira. 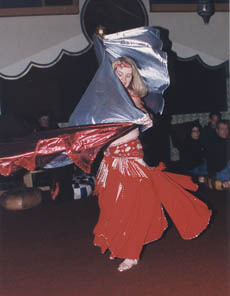 Describes how to make a standard rectangular veil for belly dancing. Ask the Costume Goddess: Machine-Sewing Sequins. Tips on attaching sequins by machine.